Fretwork has existed for thousands of years and originated as way to cover objects with an ornamental grid or lattice. Traditionally carved from wood or made of metal,fretwork has found its way into all aspects of design.Fretwork patterns adorn fabric of all types and can be made of more rigid Greek key style designs or a more rounded,intertwined style. No matter what your style is, you can find the perfect fretwork pieces for your space! Below are some perfect examples of how to bring fretwork designs right into your very own home. These decorative pieces can either serve as a pop of detail or as the main focal point depending on how you want to incorporate the pattern. At Designer Living, we offer everything from fretwork sheets to fretwork shower curtains so you can create the exact look you are going for. 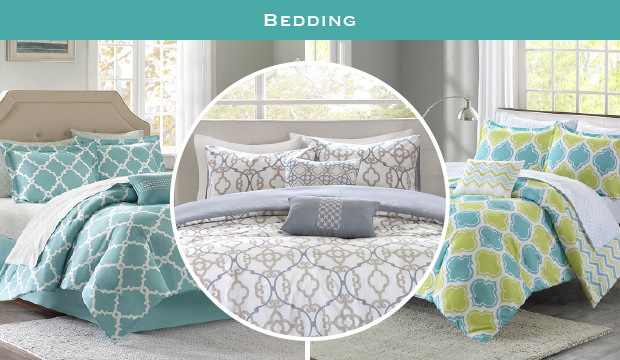 When choosing fretwork bedding, there are a few styles to look for. Some may be a simple design with bold colors while others may be more intricate patterns featuring neutral colors. If you choose bedding with a fretwork design, expect this piece to be the main focal point of your bedroom. Finish this look by adding complimentary throw pillows and window treatments to keep all the attention on the bedding itself. If you prefer a more simple look, you can combine a solid colored bedspread with fretwork sheets. No matter how you choose to design your bedroom, Designer Living offers a wide selection of fretwork bedroom decor that is perfect for any kind of style. Figure out the type of window curtains you need for your space. 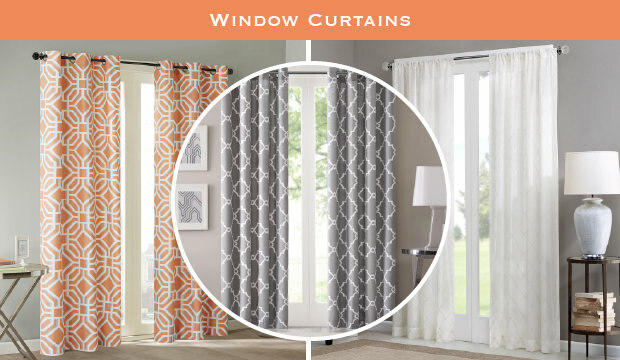 You can find fretwork patterns on standard curtains, or specialty styles like energy-efficient or sheers. Window curtains are an excellent element to add to a space. Not only does it serve the practical purpose of keeping light out, but it also adds a nice decorative touch as well. Whether you are looking for simple or bold, fretwork curtains can be the perfect addiction to any living room or bedroom. Check out our curtain buying guide for more tips. Create a lasting impression with fretwork furniture pieces. These work beautifully with solid colored pieces in your existing space. 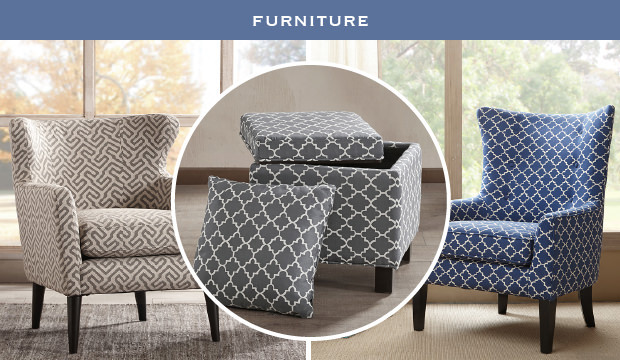 Choose from updated classic shapes like wingback or rollback chairs, or get functionality with a storage bench. Fretwork furniture pieces are an excellent way to add both sophistication and style right into your living room. If your interior design is feeling a little outdated, adding an eye-catching fretwork furniture piece will help to create a modern and updated look. Want a quick splash of fretwork? Start with your bathroom! Since most bathrooms have a neutral, solid color palette, incorporating fretwork is easy. Choose a shower curtain or bath mat to bring some pattern into your bathroom space. To complete this look, bring in solid colored hand towels to tie it all together. This is the perfect way for giving your bathroom a modern update without having to do a complete remodel. For more home decor inspiration, check out our guides and collections at Designer Living. We have a wide selection of interior design pieces in any style offered at affordable prices so you can create the home of your dreams. Get shopping now!